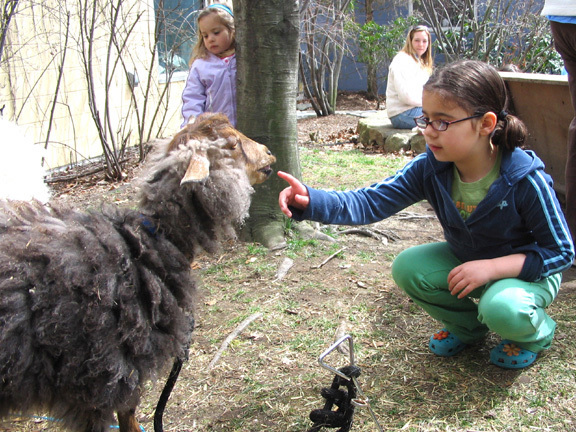 Fleecy Friends: Kids meet goats, lambs, ponies and bunnies on April 15. Providence Children’s Museum is open for April school vacation, daily from 9:00 AM to 6:00 PM and Friday, April 19 until 8:00 PM, with special programs and performances all week long. Families meet baby goats and lambs, take a pony ride, pet a bunny, and see how fleece is spun into yarn. Recommended for ages 2 and up. Using big blue foam blocks, wheels, spools and tubes, kids construct castles and cities, create artful sculptures, design whimsical creatures, and much more – the possibilities are endless. Families meet an awesome assortment of live animals! Children have close encounters with furry friends, slithering snakes and other incredible creatures and learn fascinating facts about them from animal expert Dave Marchetti of Animal Experiences. Recommended for ages 3 and up. The Pumpernickel Puppets present a colorful cast of characters and invite audience participation in playful performances of “Peter Rabbit.” Shows at 1:00 & 2:00 PM; recommended for ages 3 and up. Providence Children’s Museum is open free of charge from 5:00 – 8:00 PM for “MetLife Family Friday – Free at Five!,” sponsored by MetLife Foundation. Stay out late and splash, play, explore and discover!